​Call TJ Stables at 519-354-7517 today to register your child. Vaulting is best described as the art of dance and gymnastics on horseback. 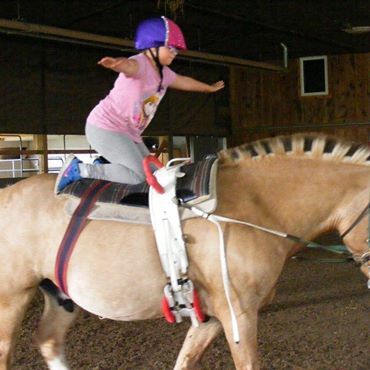 Vaulting is not only fun, but also increases the rider's balance and confidence on the horse. It requires a level of flexibility and athleticism. The TJ Stables vaulting team often performs at events and parades alongside the Canadian Cowgirls. Call 519-354-7517 to book your lessons. Prerequisite: In order to join this class, riders must have their full green level. All riders joining vaulting lessons must have a balanced and confident seat while walking and trotting. All students unknown to us need to book an assessment by TJ Stables instructors to verify riding level and get approved to participate in this class.